Customize the portal for your subscribers. You can display your contact information and offer your subscribers different types of content (like weather forecasts and news feeds) through the portal. You can also enable elements such as the DSL Signup for your subscribers. Enter your preferred details and links in the fields and click on Preview Portal on the upper-right corner to see how it will look. When you’re satisfied with it, click Save Settings. Open a trouble ticket to report your technical concerns (see below). Administer usage shaping, which means you can limit the number of hours per month that your users can spend with your internet service. You can control the hours globally or on a user-by-user basis. Just click on the arrows to modify the limit. Manage your email notifications. You can choose to subscribe to notifications such as those from the Visp.net NOC Nuuz and trouble ticket broadcasts. Open the exclusive Visp.net Migration Manager, which tracks each movement during your migration (if you ever go through one). Visp.net assures that virtually all your subscribers and data are retained after the 30-day migration period. An overview of the migration process is presented in graphical form in the Migration Manager, and you can click on this graph to see the details of each step in the process. In the Administration section, you can also find links to the visp.net NOC Nuuz and Help Wiki. Trouble tickets are a way of reporting your technical concerns to Visp.net. They go directly to Visp.net’s customer service staff and/or system administrators, ensuring that your issues are handled well and fast. Go to the Administration section in the Support Site. Click on Open a Trouble Ticket, and you will be given a form to fill out. This will be your trouble ticket. Fill out this form – you’ll want to make it as accurate as possible so Visp.net can provide the right help. Give special attention in providing a summary and a specific, detailed description of your concern. If you need a guide on filling this out, you can simply refer to the specific instructions right below the form. After you’re done, check on the acknowledgment and click Submit Ticket. 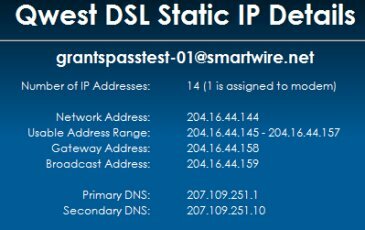 Once you have verified this, select the Advanced Setup option, and select Block of Static IP Addresses (Unnumbered Mode). In the Gateway Address field, enter the gateway (modem) IP provided, and in the Subnet Mask field, enter the provided netmask. Also, please be sure to select the VIP mode checkbox. Proceed with the setup and save settings/let the modem restart, and you should be ready to use the IPs.